Zu-za Possessed By The Cain Spirit! 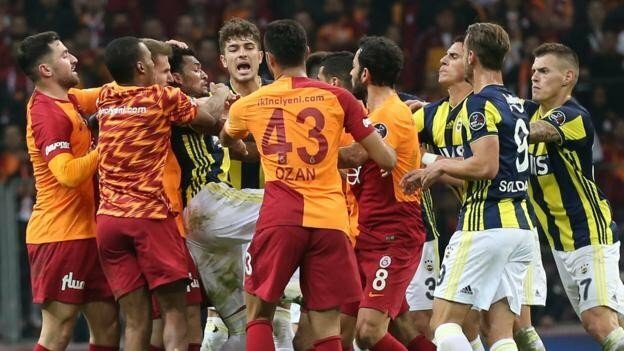 Ghana ace Andre Ayew has escaped sanction by the Turkish FA on Thursday after five players were slapped with heavy bans following the brawl in last week's Galatasaray-Fenerbahce match. Ayew, was among the players who tried to separate the fighting players, was thought to be among the players who feuded during the confusion in the Lig 1 match. Former Tottenham striker Roberto Soldado was one of five players suspended following the brawl that saw members of both teams exchanged blows on Friday. Soldado, 33, who joined Fenerbahce from Villarreal in 2017, was one of three players sent off and the Spaniard was banned for six matches. Fenerbahce's Jailson Siqueira received an eight-match ban and Galatasaray's Badou Ndiaye five matches. Galatasaray boss Faith Terim was given a seven-match ban for insulting the referee and for comments he made in the post-match news conference. Assistant Hasan Sas was banned for eight matches for attacking members of the opposition. Galatasaray midfielders Garry Mendes Rodrigues and Ryan Donk were banned for three and six games respectively for unsportsmanlike conduct. Both teams were also fined.